Yay it's Tag Friday over at A Vintage Journey and time for the Creative Guides to have some time to create a tag that is totally their own without any constraints whatsoever and I have to say I really enjoyed getting out some new (to me) dies from Seth Apter and my box of left over backgrounds to create one with a grungy, timeworn feel to it. I cut the tag from a a piece of card that I had obviously been experimenting on using both my treasured DecoArt media fluid acrylic paints and much loved distress inks. Later I added some stamping using one of Seth's background stamps. Using more leftovers I die-cut shapes that would fit together to make up a design and several of those shapes I cut several times to create strong, rigid pieces that when layered together produced a fabulous 3d feel. I built up the focal section and then layered it using foam squares to create height and more dimension. ..... and when those pieces fit together quite naturally without too much effort. 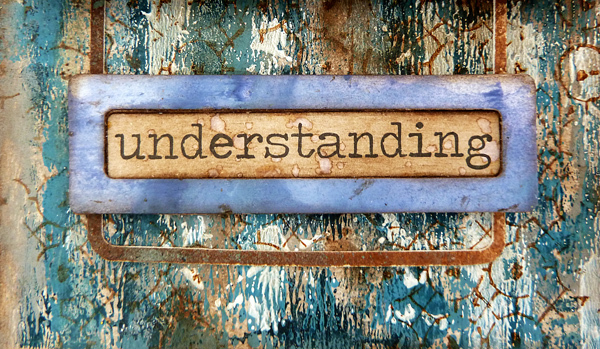 The focal word came from Tim's Big Chat stickers and the only deciding factor for my choice of the word was it's length - it just fits neatly into the frame. 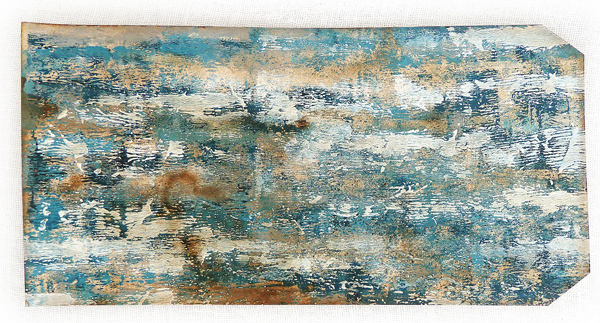 ..... a battered, weathered construction that has a bit of an assemblage feel to it. Thanks for coming over to see what I have made for the Tag Friday line up and do pop over to AVJ to see the most amazing inspirational pieces from the rest of the team. 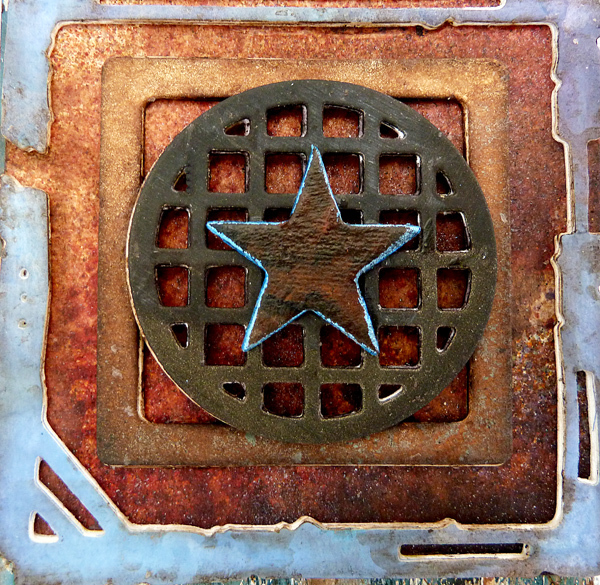 Beautifully put together, love all those rusty timeworn effects, perfect for those Seth Apter dies, - a match made in heaven! Have a great, happy and healthy New Year! A real stunner Brenda, you certainly put those new Seth dies to good use! Beautiful background, great looking rusty elements, fabulous design, I just love everything about this! I like your combination of shapes on this tag. Wonderful layers and great grungy pieces, its a fantastic tag. A wonderful tag - a WOWSER ! I always adore your wonderful pieces Brenda! A fabulous dimensional tag, Brenda - that background is just stunning. What a wonderful way to finish the year. Wishing you and yours a peaceful 2017. Stunning Brenda!!! 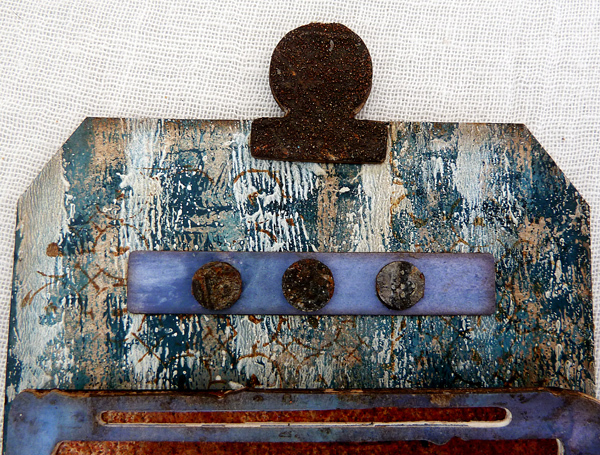 What a gorgeous mix of colours - the blue and the rust - and your background dis wonderful. Thank you for all your fabulous inspiration through the year - here's to 2017! I love the tall layers, and the texture is fabulous. Gorgeous color too. Happy happy new year to you! 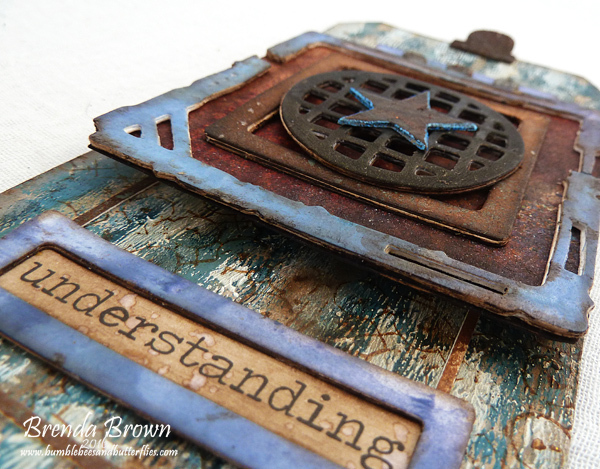 Fabulous layered tag with those colors that just speak to me! It's wonderful how you took so many leftover bits and then transformed them into this beauty! Happy New Year! Stunning! 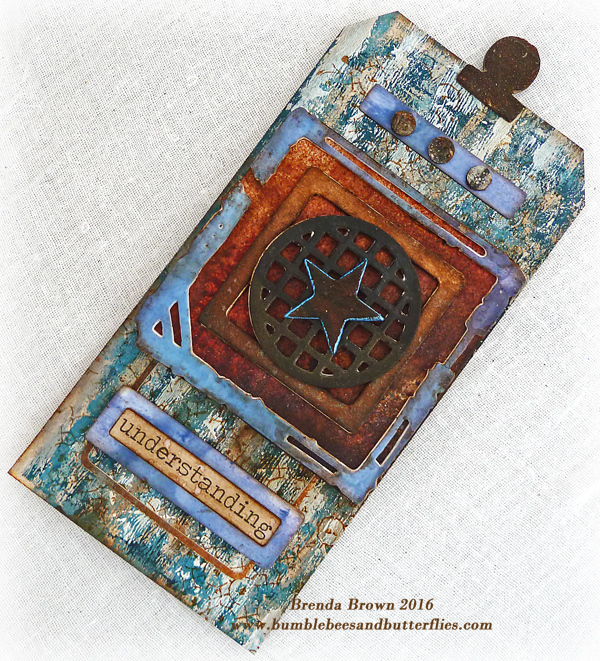 Colour, dimension, texture, technique, fabulous stamps and dies - this tag has it all Brenda . A terrific way to end your amazing year of crafting . Thank you for everything . 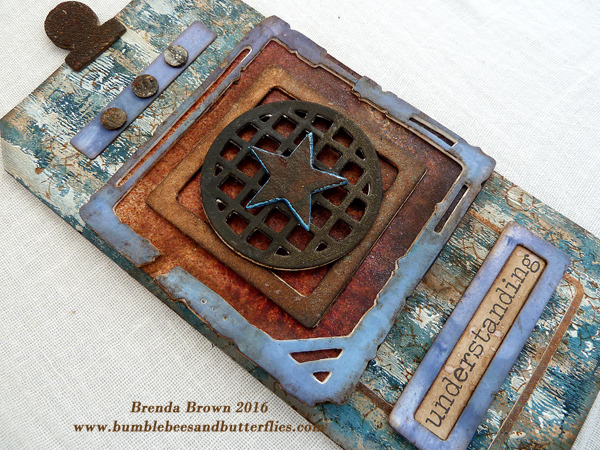 I love everything about this Brenda - the color choices, the rusty patina, the layering. Oh so grungy and wonderful. 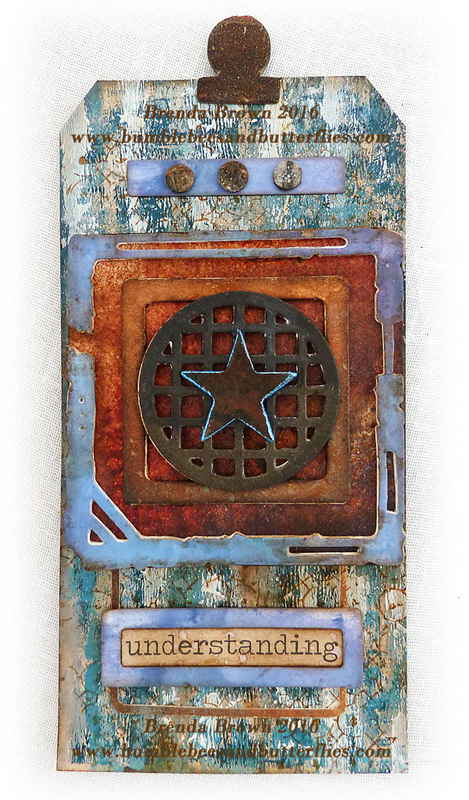 Great tag, love the rusted effect and fabulous layering.